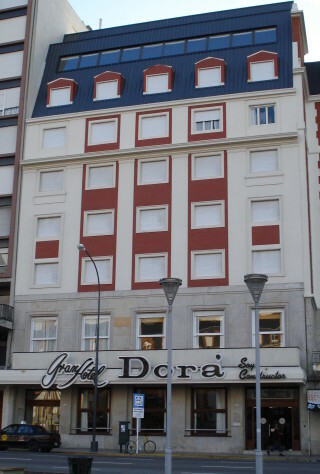 Hotel Dorá facade This recently remodelled hotel offers four star services in one of the most centric spots in the city. Although it was built in the fifties, it now stands in a contemporary style with many delicate details. A big lobby welcomes you with many couches and a small bar at the end. The first floor includes a huge dining room where breakfast and two meals will be served. Beverages, apart from plain water, will have to be paid by each attendant. There's also a second bar inside the dining room. As this place is so big, we will use part of it as hacklab. The talks will be held in the seventh floor, where an impressive view of the coastline can be enjoyed. There is also a second talk room next to it, and a foyer where another hacklab will be set up. As we're completely filling up the first hotel's capacity, a second hotel with similar characteristics will be used for lodging. The Ástor is also a four star hotel, with very nice rooms and a welcoming staff. This hotel was built around the same time as the Dorá, and it currently retains its old fashioned style. It's located less than three blocks away —a couple of minutes walk— from the Dorá, and you can take the opportunity to walk the San Martín pedestrian street, a traditional shopping street. Lots of wood and comfy couches welcome you in the lobby, and you can also have a drink in the bar next to the elevators. Breakfast will be served in the first floor, in the "mirrors hall".